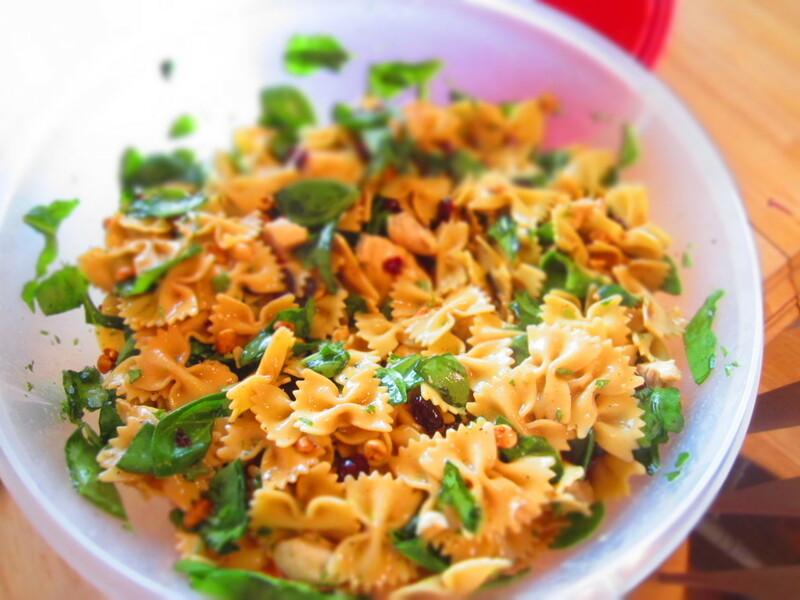 Bow tie pasta combined with spinach, cranberries, honey roasted peanuts, chicken, fresh parsley, and a homemade sweet teriyaki dressing…need I say more??? This salad is SO GOOD! My mom makes this all the time when she is hosting us. First off, it makes a ton, so its great because it will either last throughout the weekend, or if a lot of family come visit her she knows that each of us will get some! My mom got the recipe from a friend, tweaked it a bit to make it her own, and has now become a wonderful, familiar dish to our family. We pretty much refer to it as “that bow tie salad”…it doesn’t need an official name, the flavor speaks for itself! It’s perfect for family functions, or if you have to bring a side dish to a party, picnic or any kind of event. If you feel like having chicken in the dish would compete with a main dish (or you are a vegetarian) you can easily take out the chicken and and not sacrifice the integrity of the dish. Cook pasta. While pasta is cooking combine the dressing ingredients. Drain cooked pasta and mix it with the dressing in a large bowl. Cover and chill. Combine spinach, dried cranberries, peanuts, chicken, and parsley. Add pasta and toss. Add oranges just before serving.